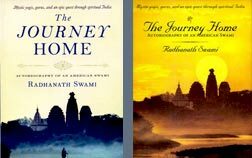 Richard (now Radhanath Swami) had begun his spiritual quest with a desire to learn many things from as many paths as possible. Slowly it began to dawn on him that this is a vague idea; for those who impressed Richard as advanced had committed themselves to a particular path. Richard now began to feel that he needed to choose a guru and a fixed path to progress spiritually. He knew he had to take serious responsibility for his spiritual life and could no longer afford to be at crossroads. Radhanath Swami analyzes the tricks of the mind. if we do not take a determined stand and work hard to progress, our mind will waver from one path to another. Today we will seek one path, tomorrow another, and the result is we won’t make any tangible advancement. “Such wavering by the mind is a breeding ground for maya, illusion, to take over your consciousness”, says Radhanath Swami. Therefore Radhanath Swami encourages his students to take serious responsibilities and make firm commitments in their spiritual lives. Then naturally, the mind being bound by the commitment to a path concentrates and inspires us to achieve something for God. “Otherwise”, Radhanath Swami says, “Mind does only two things- accepting and rejecting. This tossing makes us miserable and frustrated, even as practicing spiritualists.” Therefore it’s vital for our spiritual health to take serious responsibility and be fixed on our path with resolute determination. Radhanath Swami speaks about the miraculous transformational capacity of his spiritual master, Srila Prabhupada who went to the America when youth practiced and preached ‘do what you want, when you want, how you want, any time you want, anywhere you want, anyway you want’; that’s the life of happiness, declared the hippies. But Radhanath Swami says that Srila Prabhupada could see through the façade and felt pity for these millions of lost souls who were simply puppets in the hands of maya or illusion. Radhanath Swami compares the illusory energy to be a puppeteer and all of us as tiny puppets. 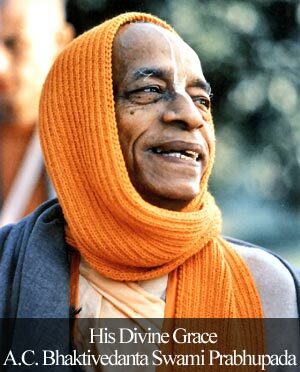 However if we take serious responsibility like Srila Prabhupada took on behalf of his spiritual master, Radhanath Swami assures we will become puppets in the hands of God. Then our lives will have deep meaning and substance. One solution offered by Radhanath Swami is to take vows in spiritual life and keeping them despite al temptations and obstacles. When we take vows and are determined to follow it at any cost, we show our seriousness to God. That seriousness then helps us attract God’s attention. Radhanath Swami and his students follow serious vows and commitment to spiritual life. This not only helps them remain focused, it also builds more purity of thought. Radhanath Swami often gives the example of his close friends, Jananivas and Pankajanghri who lived in a remote village in Bengal for over forty years. In extreme climatic conditions and hardships like floods and severe cold, with bare minimum facilities, the duo persevered in their service to their spiritual master. Richard was getting closer to choosing a firm path, and was about to set ablaze spiritually. Very important aspect for progressing on spiritual path has been deliberated here. In the absence of firm conviction in the words of Krishna and His devotees, determination will not be there. After fully convinced,one should carry out spiritual practices with determination.I beg to devotees for theie mercy so that I could develop little with determaintion. As mentioned min an seriously take us for a ride, if we are not 100% commited to our path. Its high time that each of us understand the core principle that Radhanath Swami realized- to be steadfast in ones determination. Thanks for sharing this article. Very informative piece of information. Thank you very much for such important information. I will surely try to follow footsteps of Radhanath Swami Maharaj…. Thank you for sharing these wonderful thoughts. We must learn to focus our mind without allowing it to be a victim of the unlimited weapons of mass distraction in today’s modern age. 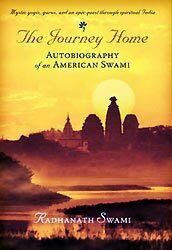 Thank you Radhanath Swami for providing such a clear cut insight into how to progress in spiritual life by taking vows and sticking to them, no matter what. It is very much truth to accept the duty with full responsibility. All glories to HH Radhanatha Swami Maharaja. very inspiring, esp. the part that unless we make serious spiritual vows, we can never improve. Thank you very much for such important information. we should surely try to follow footsteps of Maharaj….Very informative piece of information. This is the most essential lesson one must endeavor in spiritual life! HH Radhanath Swami really shows us by his own example how to achieve the pat of perfection by having fixed on our goal. Maharaj rightly said how important is to be determined in the spiritual path. The sooner we feel the urgency of taking up spiritual life the better. Sometimes God has to shake us up a bit before we feel the desperate need to take up spiritual life. When i heard Radhanath swami maharaj lecture then got somany wonderful thing like enthusiasm, strength,positive attitude and sincerely devotional practices. Hare Hrishna. As HH Radhanath Swami instructs, taking vows and following them with determination help us cling on to the path of spirituality. HH Radhanath Swami Maharaj has nice instructs us when we deeper in our spiritual practices deeper in satsangh ,kirtan association of devotee then whatever situation comes it can not effect us. This is such an important and powerful article. We may be practising so-called spiritual life because our mind likes it. But beyond our mind’s likes and dislikes is the need to take serious responsibility in spiritual life. Its only then that we make tangible spiritual advancement. Thank you Radhanath Swami for this most inspiring lesson.